What is the Union Symphony League? The Union Symphony League (USL) is a glad addition to the vibrant cultural life of Union County. Formed as a subsidiary of the Union Symphony Society, Inc. (USSI), the USL has a two-pronged focus: 1) to organize and execute events designed to promote the social and cultural life of Union Symphony, and 2) to assist in the fundraising efforts of the USSI. The money raised by the USL helps fund concerts by the Union Symphony Orchestra, the Union Symphony Youth Orchestra, as well as Union Jazz and our small ensembles. The USSI is committed to entertaining the public and offering musical education opportunities for both youth and adults. The work of the USSI is a valuable asset to the cultural life of Union County, and the USL proudly supports this mission. Is membership to the USL by invitation only? Absolutely not! Please contact the symphony office if you are interested at 704-283-2525. Can you be more specific about the kinds of responsibilities that will be involved in these events? Listen to live jazz music featuring music by Union Jazz Director Dennis Contreras & Friends during this casual event to benefit Union Symphony. The Symphony League celebrates Union Symphony Society’s Tenth Year of service to this region with hosting this holiday extravaganza which features seven of Monroe vicinity’s most attractive and gaily decorated homes. From whimsical to Victorian, the homes will give you breathtaking moments of beauty and interesting ideas for Christmas decorating. Enjoy an evening of romantic dining and dancing along with a short concert, Up Close & Personal, by Union Symphony with Artistic Director Richard Rosenberg. This elegant signature benefit includes an auction, all proceeds benefiting Union Symphony. USL hosts a special reception for supporting patrons to follow the Union Symphony Orchestra spring concert. It is an occasion to express our appreciation for your ongoing support of Union Symphony. The Union Symphony League hosted a glorious reception in the C. Douglas Helms Art Gallery for supporting patrons. It was an occasion where we could say thank you for their ongoing support of Union Symphony. The refreshments were delightful, the art gallery featuring the woven creations of Dr. Louise S. Napier added such a unique panache, and members of the league exhibited their characteristic elegance and hospitality as they greeted symphony guests. We are grateful to our patrons — including the lovely members of the Union Symphony League. 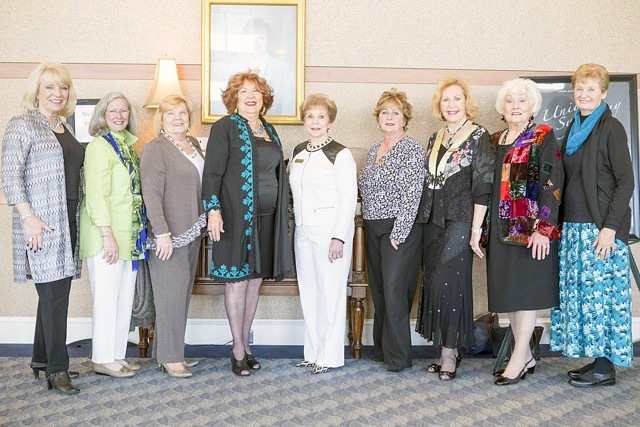 (Left to right) Ravonne Pender, Donna Norwood (Chair), Diane Robb, Gail Leaird, Linda Rummage, Shelly Nelms, Carole Williams, Lois Crumpler, and Beth Joy Fowler. Not pictured: Linda Grue, Dorothy Maloney, Jo Moore, and Anne Stewart.